Just the action of opening up the chest and energetic heart space can be enough to shift some people’s mindset; we’re often so caught up in our own world of worries, concerns and frustrations that we tend to close ourselves off physically and emotionally from the people around us. Rounding the back, collapsing the chest and avoiding any emotional contact with others is commonplace in our busy day-to-day lives, but just by changing our body language, we can very much help to create a change in the way we feel. As I’ve said so many times before, we know how closely connected our bodies and minds are. Even if we haven’t all researched the effects of how our own body language works upon ourselves, we can all inherently feel it. Closing off our hearts from others has a very powerful impact – making us feel separate, isolated and unsupported. Conversely, when we actually allow ourselves to open up this area of the body with the intention of focussing on opening the heart, we’re likely to instantly feel more open, connected and alive. If you’ve been effected by heartbreak, loss or grief, the chest is the first place we physically close off. It sounds a little strange, but when matters of the heart are affected, it really does have a profound impact on our minds and bodies. Opening the heart center can be especially difficult if we feel vulnerable, but if this is the case, there’s even more reason to do it…. Vulnerability has the ability to stop us in our tracks; if we feel vulnerable, this often stops us from having the confidence to speak our minds, take chances, trust in others, or even trust in ourselves. Many of us feel at least a little vulnerable some of the time, but the good news is – this is a good thing. Rather than masking vulnerability or letting it overpower us, simply embrace it…. This may sounds strange, but embracing and experiencing feelings of vulnerability is actually the most empowering thing you can do. After we’ve allowed ourselves to really feel vulnerable, to feel afraid and fearful and exposed, what’s left to be afraid of? …. Seriously though, what are we actually afraid of apart from feeling afraid? The ability to stand with your arms outstretched, saying ‘here I am, this is me, and I’m doing the best I can’ and to accept whatever happens after that can be one of the most transformational things you’ll do today…. The ability not to just wear your heart on your sleeve, but to hold it in your hands and offer a piece of it to those around you can not only change your day but your outlook on life. Closing ourselves off and avoiding vulnerability is easy – embracing it is hard, but the hardest things are always worth doing. If you’re feeling vulnerable, then embrace it, feel it, open up to it. It means you’re actually putting yourself out there and doing something that comes from your heart. This variation of Virabhadrasana 1 (warrior 1) with the intention of opening up the heart combines the powerful aspects of the warrior, and the vulnerability of allowing the delicate heart space to open up. Being open hearted and human enough to admit when we’re afraid is in no way weak, it’s one of the strongest things we can do. From a seated position, take some undulating cat/cow movements through the spine, focussing especially on lifting through the chest as you extend the spine. Finish in your seated position by interlacing the hands behind the back and again opening the chest. Use your breath to expand and open the chest even more as your shoulder blades slide down the back. From there, make your way to Tadasana (mountain pose) and begin to move through surya namaskar A and B.
Surya namaskar B includes Virabhadrasana 1 in its traditional form, so focus on the grounding aspects of this posture by pressing the feet down evenly – especially the outer edge of the back foot. The back foot can act as the anchor in this posture, and when we’re firmly grounded and stable, there’s more support to allow for greater opening and expansion in the upper body. When you’ve practiced a few rounds of each sun salutation, come back to stand in Tadasana. From Tadasana, take a large step back with your [left] foot. Turn the back toes out diagonally slightly, while keeping your front knee directly over the front ankle. Ensure your front knee is pointing out towards the second and third toes, and not splaying in or out (to keep your knee healthy! ), and bring both hip bones to point forwards. As you inhale, reach the arms up alongside the ears. Create more lift and opening through the body by first actively pressing into the back foot, and then extending out of your hips and lifting the chest. Let the shoulders relax down the back, and if you have any nagging neck pain, it may feel nicer here to take the arms a little wider apart. On your next exhale, sweep the hands behind the back and interlace the fingers as you did in the seated position. Begin to squeeze the palms gently together as you extend the arms back. Roll the shoulders back and expand through the chest. Something I like to visualise here (which is also helpful in deeper backbends such as Ustrasana) is the action of the shoulder blades curling under to push the heart forwards and up. With the intention of opening up the heart space, this posture becomes a lot more than its physical aspect; it becomes a way for you to change your energy and really experience the deeper effects of your actions. Bring the breath into play by using your inhale to open up the chest even more, creating space across the collarbones and shoulders. Exhale to ground and anchor that back foot into the floor. Stay here for 5-10 breaths, or for however long feels right for you. To transition back into Tadasana, release the hands down and place them on the hips. Turn the toes of the back foot to face forwards and step the feet back together. Become aware of the effects of the posture before practicing on the other side of the body.This asana is great preparation for moving into deeper backbends like Ustrasana (camel pose) or Urdhva Dhanurasana (full wheel) and is useful to practice if you’ve been hunched over a desk all day! To counterpose this variation of virabhadrasana 1, again make your way to sit on the floor, and move into baddhakonasana, allowing your spine to round a little and taking your focus inward by closing your eyes. 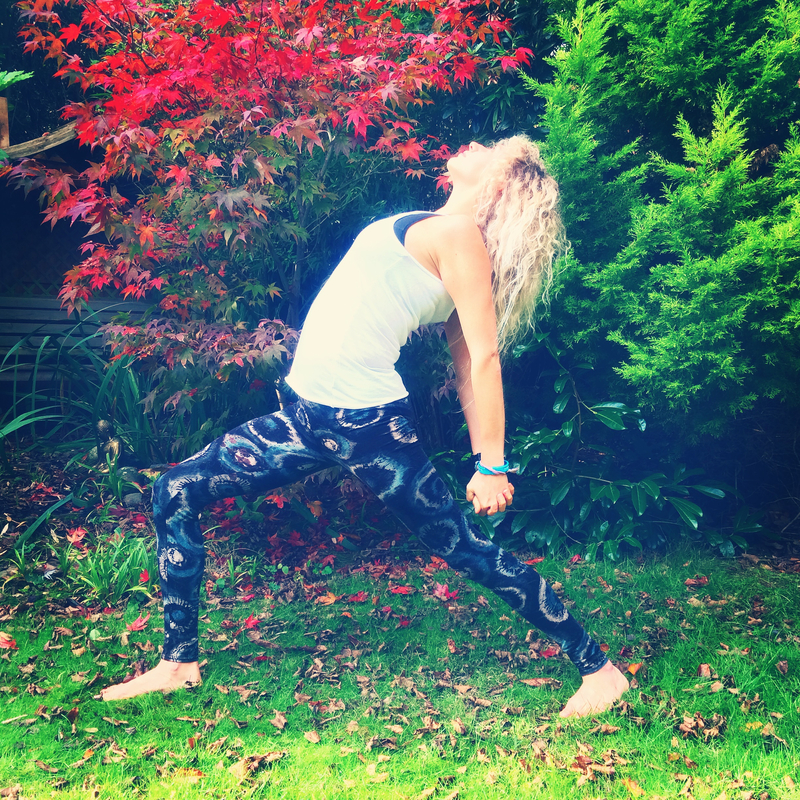 Open your body, open your, heart, open your mind….